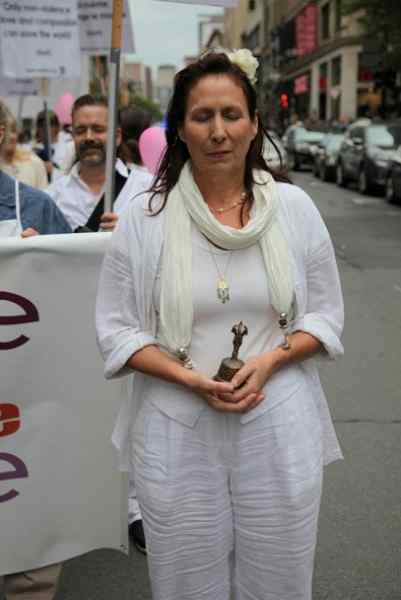 About fifty Raelians from across Quebec rallied for a peaceful march along the busiest street in downtown Montreal. Peace songs resonated throughout the city during the march, intermixed with moments of meditation directly on the street. "The event ended with a 'One minute meditation for peace' in a park we previously invited people to by handing out invitation cards", explained Melove, organizer of the march. 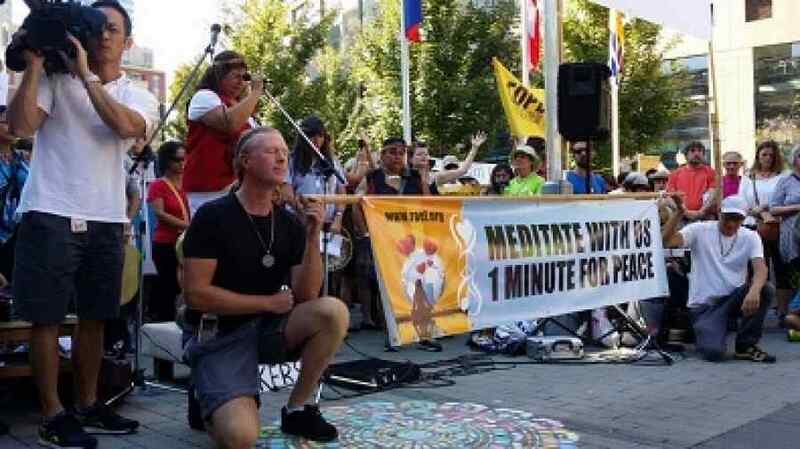 "In Toronto we were in High Park to guide a global meditation for peace, synchronized with various other groups like Unify," said Patrick Rhein. In this natural woodland in the middle of the largest city of Canada, Diane Brisebois, a Raelian Guide, conducted a wonderful meditation with images that had a lasting impression on the participants. A few hours later at the other end of the country the Vancouver team, under the supervision of the provincial leader David Dunsmore, concluded this day by joining the activities organized by Unify on this day of global mobilization. Several other groups were present to form a crowd of thousands of people who also want to save humanity. 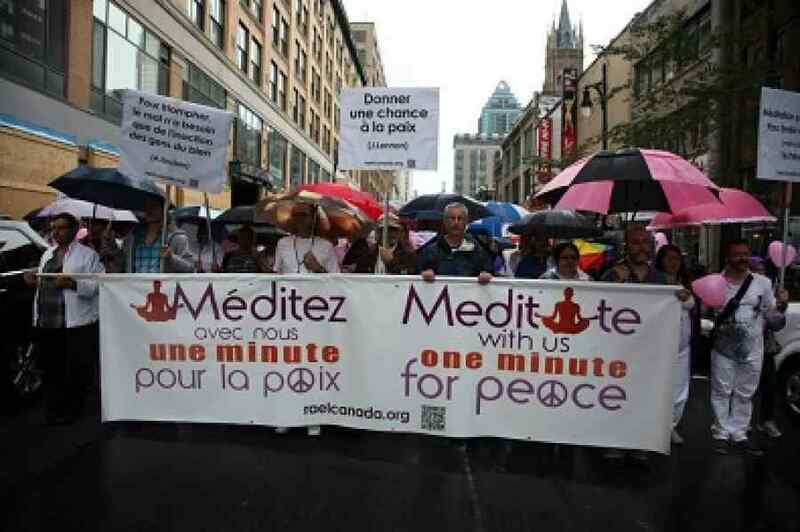 "We were not officially part of the event, but when the organizer saw our banner inviting people to meditate one minute for peace, she decided that for the opening of the day, we would have one minute of silence. She asked us if we agreed to be on stage with our banner during this minute", said Dunsmore. The peace march went on to the Mountain View Military Cemetery where the Raelian group continued to spread their message of love and peace, thinking of all the human beings who have died from violence. For more than 40 years the Raelians have been committed defenders of non-violent and peaceful actions, following the words of their spiritual leader Maitreya Rael: "Non-violence, love and compassion is the only way to save humanity." 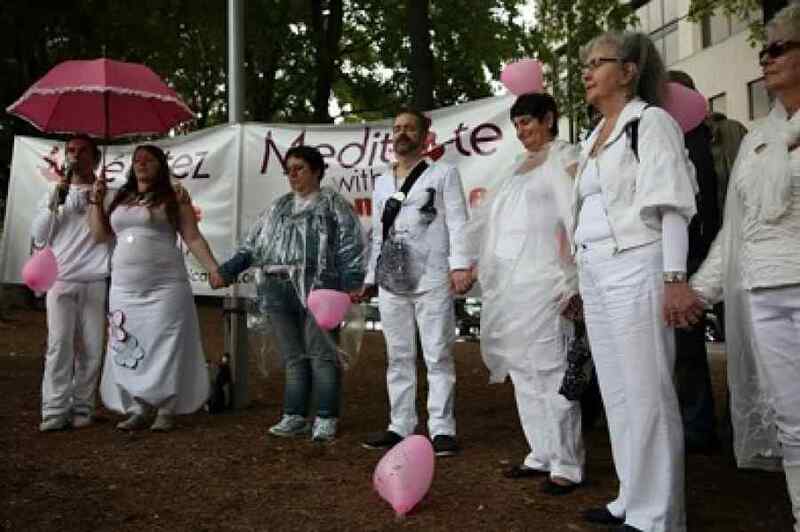 The Raelians are inviting the public to meditate "One Minute for Peace in the World" as often as possible, at home alone or even better, in groups. Don’t miss the next gathering!